CHARLOTTESVILLE, Va. (AP) — A man wanted in connection with the beating of a black man in Charlottesville on the day of a white nationalist rally turned himself in to authorities in Georgia and will be extradited to Virginia, officials said. Alex Michael Ramos, 33, surrendered Monday evening at the Monroe County Sheriff's Office, Sgt. Lawson Bittick told The Associated Press on Tuesday. 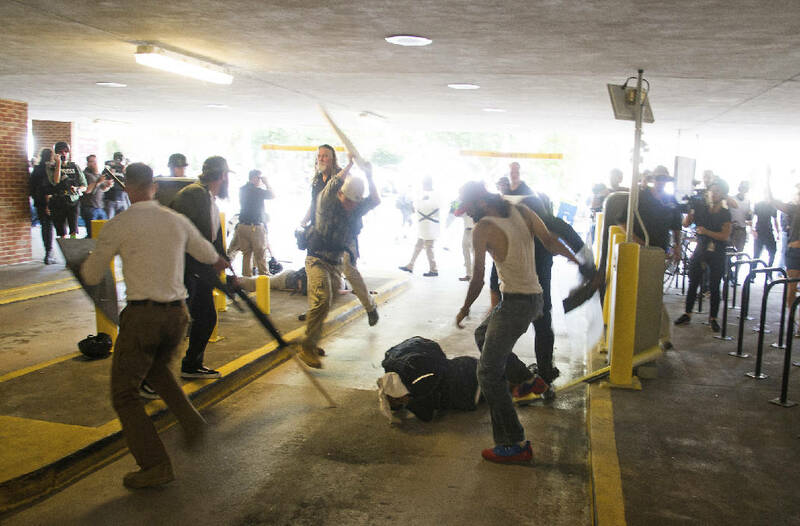 Ramos faces one count of malicious wounding in the attack on DeAndre Harris, which was captured in photos and video that went viral. The Aug. 12 attack by a group of men left him with a concussion, abrasions and contusions across his body, as well as a head laceration that required staples, a knee injury and a fractured wrist, according to his attorney. Ramos agreed to be extradited to Virginia during a hearing Tuesday, said Kathy Barfield, deputy clerk of the Monroe County Magistrate Court. Bittick said Ramos is an unemployed construction worker, and he didn't know if he had obtained an attorney. In an interview with Atlanta TV station WGCL, Ramos said that he hit Harris once and that others beat him with sticks and shields. He called the incident "a defensive attack." Ramos also said he is not a white nationalist. "I was there because, pretty much, I'm a conservative. ... There were some non-racist members who were going to a free speech rally," he said. Harris, a 20-year-old special education instructional assistant, attended the rally with friends to show his opposition to the white nationalist groups, his attorney, S. Lee Merritt, said. A member of Harris' group began arguing with a white supremacist over a Confederate flag, Merritt said in a statement. Harris intervened just as the white supremacist attempted to spear his friend with the flag's pole, the statement said. Harris tried to retreat but was pushed to the ground by a man holding a shield with the symbol of a white supremacist group, and the group of men swarmed him, beating him with blunt objects, according to the statement. Another man accused in the beating, Daniel Borden, 18, of suburban Cincinnati, appeared by video Tuesday and declined to waive extradition to Virginia, where he also faces a charge of malicious wounding. Hamilton County Magistrate Michael Bachman set bond at $100,000 and scheduled a Sept. 29 hearing. Attorney Greg Berberich has said Borden's family expects him to be exonerated. Merritt said he intended to file a federal civil rights lawsuit against all parties responsible for the attack in the coming weeks. Ramos and Borden were identified through the efforts of journalist and activist Shaun King, who has been posting photos and video of the assault on social media and offered a reward, Merritt said. "With information including affiliated organizations, clear photographs, and recordings, it is disappointing that the combined efforts of federal and local agencies have failed to lead to either the identification or arrest of additional suspects," Merritt said in the statement. Meanwhile, a Ku Klux Klan member charged with firing a gun during the rally remained in Baltimore County pending extradition. Randy Mentzell, the county Department of Correction's commitment manager, said she didn't know when Richard Preston, 52, would be transported to Virginia.